Tech billionaire Larry Ellison — the owner of defending America’s Cup champion Oracle Team USA — has given $4 million overall to the super PAC supporting Republican presidential candidate Marco Rubio, according to a report by Politico. The story said, “A super PAC supporting Marco Rubio’s presidential campaign raised $2.5 million in January, including $1 million from tech billionaire Larry Ellison, according to a report filed Saturday with the Federal Election Commission. “The donation from Ellison, the executive chairman of Oracle Corporation, brings his total spending on behalf of Rubio to $4 million, making him among the top donors of the 2016 cycle. The 2016 United States presidential election is scheduled for Tuesday, November 8, 2016. Hillary Clinton and Bernie Sanders are seeking the Democratic nomination, while Dr Ben Carson, Ted Cruz, John Kasich, Marco Rubio and Donald Trump are all running on the Republican side. 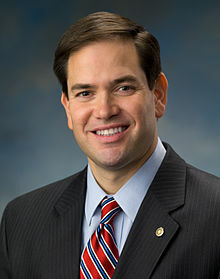 Rubio is against SSM! Thanks for supporting a great republican candidate! More proof that PLP supporter base is equivalent of the republicans. What a waste of money by Ellison. Could have changed many lives with that money. Instead appears to have thrown it away. This has nothing to do with PLP and the money is being well spent on a candidate that says he believes marriage should be between one man and woman. “Pro family, pro life, Pro faith! Good job Oracle! My teams owner has Pro traditional marriage values! As do most Bermudians! Cheers!